Both parental and HR cell lines were treated with bosutinib (0.01, 0.1, and 1 μmol/L) for 24 hours. 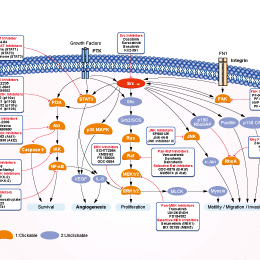 Src-related signaling pathway molecules were then analyzed. Mol Cancer Ther, 2017, 16(6):1145-1154. Bosutinib (SKI-606) purchased from Selleck. Abl kinase phosphorylates MNRR1 in vivo. (A) K562 cells harboring the constitutively active BCR-ABL kinase when treated with 100 nM Bosutinib for 24 h show a reduction in MNRR1 phosphorylation. Lysates from vehicle and Bosutinib treated cells were immunoprecipitated using the anti-phosphotyrosine antibody and analyzed for the levels of MNRR1 in the precipitate. The IgG levels are also shown for an equal pull-down. Bosutinib efficacy was confirmed using antibodies against phospho-Abl kinase and phospho-STAT5, a downstream target of Abl kinase. Tubulin was used as a loading control. (B) Bosutinib treatment reduces the levels of phosphorylated proteins only. The total protein levels (Abl kinase and MNRR1) in vehicle and Bosutinib treated cells were similar. (C) Levels of Abl kinase in the WT and Abl kinase deficient MEFs (Abl−/− MEFs). The doublet is caused by the presence of a non-specific band . (D) The level of oxygen consumption in WT MEFs transfected with either WT or phosphomimetic Y99E mutant MNRR1. Oxygen consumption was measured in intact cells on a Seahorse Bioanalyzer. (E) Y99E mutant MNRR1 stimulates oxidative phosphorylation better than WT MNRR1 in Abl deficient MEFs (Abl−/− MEFs) as measured by intact cellular oxygen consumption. (F) Bosutinib also inhibits BCR-Abl kinase in the mitochondrial fraction. NDUFS3 was used as a mitochondrial marker and GAPDH as a cytoplasmic marker to evaluate purity of the fractions. (G) K562 cells treated with Bosutinib, which show a reduction in the level of MNRR1 tyrosine phosphorylation (A), also have a reduction in the levels of oxygen consumption. (H) MNRR1 is not phosphorylated in the Abl−/− MEFs. WT and Abl−/− cellular lysates were immunoprecipitated with the anti-phosphotyrosine antibody and probed for the presence of MNRR1. The total levels of MNRR1 in the WT and Abl−/− MEFs were similar. Biochim Biophys Acta, 2017, 1864(2):440-448. Bosutinib (SKI-606) purchased from Selleck. A,IC50 of Bosutinib that block ANDV-induced EC permeability. Endothelial cells were ANDV infected, and 3 days postinfection the permeability of cells in response to VEGF addition was determined in the presence or absence of increasing amounts of kinase inhibitor. The effect of inhibitors is presented as the percentage of ANDV-induced permeability of inhibitor-treated monolayers 3 days postinfection and 30 min post-VEGF and FITC-dextran addition. B, VEGFR2-Src inhibitors block ANDV-induced permeability. Endothelial cells were plated on vitronectin-coated Transwell inserts and infected at an MOI of 0.5 in triplicate with ANDV. Three days postinfection, the permeability of ANDV- and mock-infected endothelial cell monolayers was determined as described for Fig. 1 at indicated times in the presence or absence of Bosutinib . J Virol 2011 85, 2296–2303. Bosutinib (SKI-606) purchased from Selleck. SFK inhibitors abrogate tyrosine phosphorylation associated with sperm capacitation. Mouse sperm were incubated in the absence or in the presence of SKI606 for 60 min in capacitating (cap, with HCO3) or non-capacitating media (NC, without HCO3). Western blot analyses were performed withanti-pY antibodies. J Biol Chem 2010 285, 7977–7985. Bosutinib (SKI-606) purchased from Selleck. Rescue ofPKAand tyrosine phosphorylation by Ser/Thr phosphatase inhibitors. A and B, spermwere incubated in capacitating medium supplemented with SFK inhibitors and different concentrations of okadaic acid (OA) (A) or calyculin-A (B), before immunodetection of p-PKA substrates (clone 100G7E). C and D, PVDF membranes used in A and B were stripped as described and used for Western blot immunodetection with anti-PY antibodies (clone 4G10). Dr. Pablo E.Visconti from University of Massachusetts. Bosutinib (SKI-606) purchased from Selleck. The Src kinase activity is measured in an ELISA format. 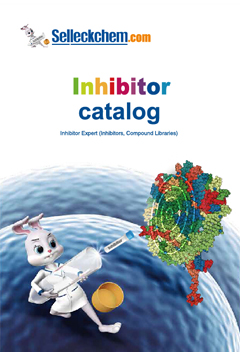 Src (3 units/reaction), reaction buffer (50 mM Tris-HCl pH 7.5, 10 mM MgCl2, 0.1 mM EGTA, 0.5 mM Na3VO4) and cdc2 substrate peptide are added to various concentration of Bosutinib and incubated at 30 °C for 10 minutes. The reaction is started by the addition of ATP to a final concentration of 100 μM, incubated at 30 °C for 1 hour and stopped by addition of EDTA. Instructions from the manufacturer are followed for subsequent steps. The Abl kinase assay is performed in a DELFIA solid phase europium-based detection assay format. Biotinylated peptide (2 μM) is bound to streptavidin-coated microtitration plates for 1.5 hours in 1 mg/mL ovalbumin in PBS. The plates are washed for 1 hour with PBS/0.1% Tween 80, followed by a PBS wash. The kinase reaction is incubated for 1 hour at 30°C. Abl kinase (10 units) is mixed with 50 mM Tris-HCl (pH 7.5), 10 mM MgCl2, 80 μM EGTA, 100 μM ATP, 0.5 mM Na3VO4, 1% DMSO, 1 mM HEPES (pH 7.0), 200 μg/mL ovalbumin and various concentration of Bosutinib. The reaction is stopped with EDTA at a final concentration of 50 mM. The reaction is monitored with Eu-labeled phosphotyrosine antibody and DELFIA enhancement solution. Cells are exposed to various concentrations of Bosutinib for 72 hours. Anchorage-independent proliferation of Abl-MLV-transformed fibroblasts is measured in 96-well ultra-low binding plates treated with Sigmacote to block residual cell attachment. Cell proliferation is measured with MTS or Cell-Glo. For the determination of cell cycle or cell death, cells are prepared for FACS analysis in the CycleTest Plus DNA reagent kit and analyzed on a fluorescence-activated cell sorter flow cytometer. Boschelli DH, et al. J Med Chem, 2001, 44(23), 3965-3977. Golas JM, et al. Cancer Res, 2003, 63(2), 375-381. Vultur A, et al. Mol Cancer Ther, 2008, 7(5), 1185-1194. Golas JM, et al. Cancer Res, 2005, 65(12), 5358-5364. Redaelli S, et al. Leukemia, 2010, 24(6), 1223-1227. Sakuma Y, et al. Oncol Rep, 2011, 25(3), 661-667. Can I give S1014 Bosutinib to mice by oral gavage? If so, how to dissolve the drug? For oral gavage, S1014 Bosutinib can be dissolved in 5% Tween 80+0.5% CMC Na at 30 mg/ml as a suspension.